در این مقاله اثر متقابل آزاد‌سازی مالیو تورم و همچنین اثر متقابل آزاد‌سازی مالی و توسعه مالی رشد اقتصادی کشورهای منطقه منا در دوره 1996-2009 با استفاده از روش داده‌های تابلویی بررسی شده است. 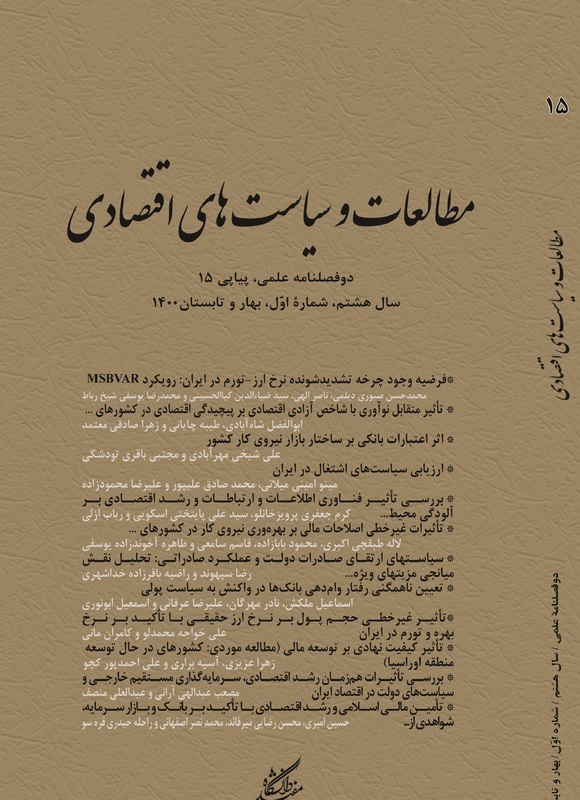 مدل مورد بررسی در این مقاله بسط مدل فراتچر و باسیر (2004) در آزمون اثر آزاد‌سازی مالی بر رشد اقتصادی است. یافته‌های این مقاله حاکی از این است که متغیر اول اثر منفی و متغیر دوم دارای اثر مثبت بر رشد اقتصادی می‌باشد. این موضوع بیانگر آن است که هر چه بی‌ثباتی اقتصادی بالاتر باشد، آزاد‌سازی مالی می‌تواند مانعی برای رشد باشد. همچنین هرچه بازارهای مالی کشوری توسعه‌یافته‌تر باشد، آزاد‌سازی مالی و ورود سرمایه می‌تواند موجبات رشد اقتصادی را فراهم آورد. This paper evaluates the financial liberalization and inflation interaction and so financial liberalization and financial development on economic growth, from 1996 to 2008, for a sample of 10 countries. We expanded the Fratzscher, M. Busier, and M. (2004) model for estimation while using Panel data Method. The finding shows that Interaction between inflation and financial liberalization has decreasing effect and Interaction between financial liberalization and financial development has increasing effect on economic growth. This study suggests that more economic instability, the more negative effect of financial liberalization and so the more financial development, and the more positive effect of financial liberalization would be an economic growth. اکبریان، رضا؛ نجاتی، مهدی؛ «بررسی رابطه توسعه بازار مالی و رشد اقتصادی با یک رهیافت هم­جمعی»، مجموعه مقالات کنفرانس سالانه سیاست­های پولی و ارزی، پژوهشکده پولی و بانکی، 1385. ارشدی، علی؛ «رابطه آزاد­سازی حساب سرمایه و رشد اقتصادی در ایران»، مجموعه مقالات کنفرانس سالانه سیاست­های پولی و ارزی، پژوهشکده پولی و بانکی، 1384. ختائی، محمود و خاوری نژادِ، ابوالفضل؛ «گسترش بازارهای مالی و رشد اقتصادی»، مجموعه مقالات کنفرانس سالانه سیاست­های پولی و ارزی، پژوهشکده پولی و بانکی، 1377. کازرونی، علی؛ «رابطه بین توسعه مالی و رشد اقتصادی تجربیات ایران»، مجموعه مقالات کنفرانس سالانه سیاست­های پولی و ارزی، پژوهشکده پولی و بانکی، 1382. صمدی، سعید؛ نصرالهی، خدیجه؛ کرمعلیان سیچانی، مرتضی؛ «بررسی رابطه بین توسعه بازارهای مالی و رشد اقتصادی»، فصلنامه پژوهش­های اقتصادی، 1386، شماره 3. معدلت، کوروش؛ «ارزیابی میزان و جهت اثر گذاری رشد بازارهای مالی بر رشد اقتصادی بر اساس یک مدل اقتصاد­سنجی»، مجموعه مقالات کنفرانس سالانه سیاست­های پولی و ارزی، پژوهشکده پولی و بانکی، 1382. نادری، مرتضی؛ توسعه مالی، بحران­های مالی و رشد اقتصادی، مقایسه تطبیقی وضعیت ایران در یک مطالعه جهانی، پژوهشکده پولی و بانکی، بانک مرکزی جمهوری اسلامی ایران، 1386. نیلی، مسعود؛ «توسعه مالی و رشد اقتصادی: مقایسه کشورهای صادرکننده نفت و آسیای شرقی»، فصلنامه برنامه و توسعه، 1381، شماره 1. خوشنویس، مریم؛ احمدیان، اعظم و مهربانی، فاطمه؛ «بررسی ارتباط بین شاخص­های بالفعل و بالقوه آزاد­سازی مالی و رشد اقتصادی در کشورهای منطقه خاورمیانه و آفریقای شمالی»، فصلنامه اقتصاد کاربردی، علوم تحقیقات، دانشگاه آزاد اسلامی، 1389. شاکری، عباس؛ خسروی، حسن؛ «آزمون نظریه مکینون - شاو در اقتصاد ایران»، فصلنامه پژوهش­های اقتصادی، 1383، شماره 14. Bailiu, Jeannine; 2000, "Private Capital Flows, Financial Development, and Economic Growth in Developing Countries", Bank of Canada, Working paper, No15. Baltaji, Badi; 1995, Econometric analysis of panel data, first edition, New York, John Wiley & Sons Press. Barro Rj, NG mankiw and X Sala-i-Martin; 1995, "capital Mobility in Neoclassical Models of Growth", American Economic Review, 85(1), pp 103-115. Bekaert Greet; Harvey, Campbell. R.,and Lundblad, Christian; 2006, "Financial Openness and the Chinese Growth Experience", National Bureau of Economic Research, Cambridge, MA. 02138ust. Edwards, Sebastian; 2001, "Capital Flow and Economic Performance:Are Emerging Economies Different?" NBER Working Paper No 8076 (January). Egger, P; 2000, "A Note on the Proper Econometric Specification of the Gravity Equation", Economic Letter, No.66, pp.25-31. Eichengreen, Barry and David Leblanc; 2003, "Capital Account Liberalization and growth: was Mr.Mahatir Right?" International Journal of finance and Economics. Fratzcher, Marcel; Bussiere, Matthieu; 2004, "Financial Openness and Growth: Short run gain, Long run Pain", European central Bank. Goldman Traub, Leah; 2006, "Financial Openness and Growth: The importance of Public and Private Sector Protections", Department of Economics, Rutgers University. Grossman GM and E Helpman; 1991, Innovation and Growth in the Global Economy, MIT Press, Cambridge. Gujarati , Damodar N; 2003, Basic econometrics, fourth edition, New York, McGraw-Hill Higher Education. Hicks, John; 1969, A theory of Economic History, Oxford, Clarendon Press, pp.143-45. Hsiao, C; 1986, Analysis of Panel Data, New York, Cambridge University Press. Klein,Michael and Giovanni Olivei; 1999 ,"Capital Account Liberalization, Financial Depth and Economic Growth", NBER Working Paper, No 7384(October). McKinnon, Ronal and Haw Pill; 1997, "Credible Economic Liberalizations and over borrowing", American Economic Review, 87:187-93. McKinnon, Ronal and Haw Pill; 1999, "Exchange rate Regimes for Emerging Markets: Moral Hazard and International over borrowing", Oxford, Review of Economic Policy, 15(3):19-39.
obstfeld M; 1994, "Risk-taking, Global Diversification and Growth", American Economic Review, 84(5), pp 1310-1329. Rincon, Hernan; 2007, "Financial Globalization, Economic Growth" World Bank Economic Review, January. Romer, David; 1993, "Openness and inflation: Theory and Evidence", Quarterly Journal of Economics, Vol. CVIII, issue 4. Stiglitz, J; 2000, "Capital market liberalization ,economic growth, and instability", World Development, 28:6, 1075-1086. Stultz, R; 1999, "Globalization, corporate finance and the cost of capital", Journal of Applied Corporate Finance, v12(3),8-25. Wang, JW; 1990, "Growth, Technology Transfer and the Long-run Theory of International Capital Movement", Journal of International Economics, 29, PP 255-271.